Our free e-course will help you better understand the process of working with community members through collective impact. This is the first of five course modules to help collective impact initiatives better understand why and how to work with community members. Each module includes resources, discussion questions and interactive exercises. While the course can be taken as an individual, it is recommended that participants discuss the modules in a group, with other members of their collective impact initiative. We recommend setting aside a few hours each work week to discuss the resources and complete the exercises. We also offer questions for each resource to help guide discussion. This module has four components to complete: Reading materials, an exercise, online discussion and a post-module survey. Access these components online by scrolling down, or by downloading the “asset package,” in the right hand column of this page. The “download this document” option listed first allows you to download ONLY the exercise if you prefer to access the reading materials online. There is also an additional exercise and additional resources to go deeper in certain areas. This e-course is not intended to be seen as the final word on community engagement in collective impact, but rather a starting place for the conversation. We offer these curated resources as an introductory scan of the literature and a way for your collective impact initiative to begin developing strategies for partnering with community members more deeply. This module will help you think through the “why” behind working with community members. The reading materials are curated to provide exposure to a variety of purposes for involving community members in collective impact, as well as a framework for developing intentional strategies and goals for engagement. The exercises will help you think through how these ideas apply to your own work and develop actionable takeaways. Why Involve Community in Collective Impact At All? This blog from Living Cities is meant to frame the main learning objectives for this module. It a tool to help you think through how and why to work with community members, which will also be used in the module exercise below. Where on the spectrum do you think your community engagement work currently falls? When you think of “community,” who do you think of? Who isn’t in that picture? This Stanford Social Innovation Review article introduces some overarching reasons about why it is important to involve community members within collective impact. It also features some of the leading thinkers on this topic. Which person’s perspective best resonates with you? What is your motivation for involving community members in your collective impact initiative? This blog post provides a hypothetical example of why you need to align the strategies for working with community members with your goals for doing so. Where have you seen a similar example in your work? Why do you think it’s important to understand the goals for engaging community members before deciding to work with them? Assessing Your Engagement Strategies: This exercise, adapted from resources provided by the Tamarack Institute, will walk you through how to link your strategies for working with community members with your goals for doing so. This exercise will serve as the foundation for much of the course, but should be revised in each module as you further explore how to work with community members. Again, it is best completed with other members of your collective impact initiative. To access this exercise, click on the link that reads “download this document” in the top-right column of this page. How intentional have you been in designing your community engagement strategies in the past? What can you change today about how you work with community members? You can join the on-going conversation on the Collective Impact Forum community discussion page, which requires free registration. To join the conversation with other course participants, join our Twitter “study hall” on Friday, March 20th at 1pm ET (10am PT; 6pm GMT) to ask your questions and share your insights. 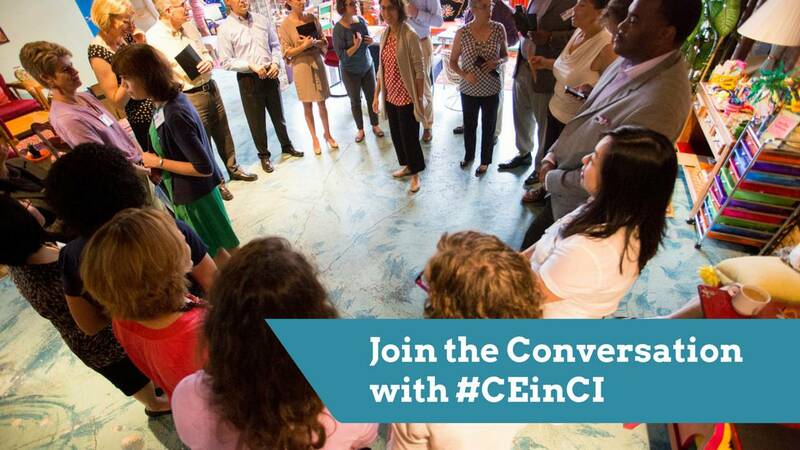 Use the hashtag #CEinCI to join in. This week, we will be joined by Sheri Brady from Aspen Institute for Community Solutions to help spark and moderate the discussion. Once you and our team have completed this module, please complete the post-module survey, which will take five minutes to complete. This survey lets us know you have completed this module, and it also gives us valuable feedback on how to improve the e-course. If you want to further explore how well the different parts of your community are connected, this tool will allow you to determine what stage of “community life” you are currently operating in. This tool is about more than just the goals of your particular collective impact initiative, but the overall health of your community relationships. This tool may be helpful for you if Rich Harwood’s comments in the “Roundtable Discussion on Community Engagement and Collective Impact” were of particular interest. This introductory blog about the exercise will help you complete it. Designing Public Participation Processes by Bryson, et al. This is an academic paper and it provides the theoretical basis for how to design engagement strategies that link to your engagement goals.